The following article by Joshua DuBois says it all, and I ask you to read it. For years I have urged those of us who identify as White to do some serious introspection. I have urged us all to enter the Black community, to make friends, attend their churches and become familiar with their culture. I have asked that we do our best to understand what it means to be an African American in this country and I have asked us to become aware of our own prejudiced, judgmental thinking and beliefs (conscious and unconscious) that create separation and contribute to festering the fear that spills over to others around us, our police, our politicians and ourselves. Until WE stop pretending racism no longer exists and understand the power of institutionalized racism (or even know what it is)… Until WE realize that flying the Confederate flag above the State Capitol (a blatant symbol of rebellion and racism) is an insidious painful reminder of slavery and separation, then WE continue to create a racist society. African Americans will continue soldiering on to the pews in the wake of the Charleston massacre. But if we’re serious about preventing future tragedies, we must confront some very old demons. 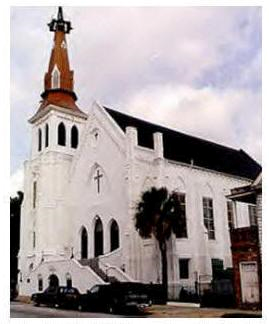 Like many Black folks, and surely like many of the deceased at Emanuel, our lives were anchored in our congregations. It didn’t matter what we were dealing with at school or work, whether the bank account was stable or declining. When we had nothing else – when the outer world was confusing or even seemed aligned against us – we always had the sanctuary that was our church. In my case, the African Methodist Episcopal Church. The A.M.E. Church is a denomination built on a foundation of holy defiance. In 1787, its founder, Richard Allen, grew tired of the segregated services at St. George’s United Methodist Church in Philadelphia and marched his fellow Black members out to form a church of their own, one that became the African Methodist Episcopal Church. From the very beginning, A.M.E.’s have had Jesus and justice running through their bones. And Mother Emanuel A.M.E., the site of Wednesday’s carnage, was founded by Denmark Vessey. He led “The Rising,” a great slave revolt plot that nearly set Blacks in Charleston free. But then we have to come back to this…sickness. That’s what it feels like to me: a sickness. Not just the one-off malady of an insane individual. But a pervasive, gnawing illness that affects him and others in our country in varying, curious ways. It’s a sickness that clouds the eyes of a police officer in McKinney, Texas – a fearful mania that causes him to see visions of children as armed criminals requiring disproportionate force. A sickness that choked the life out of a man screaming that he couldn’t breathe – Eric Garner – because that man’s blackness and bigness and humanity were just too threatening to treat gently. A sickness that allowed a police officer to see a 12-year-old child in Cleveland – Tamir Rice – and assume the pellet gun this kid was holding was a deadly weapon, and then shoot him dead. That same illness very likely affected the man who killed the nine A.M.E. souls at Emanuel Church. Yes, the killer was deranged; but he simply had a more extreme version of a common malady. That malady threatens to kill many more – either directly, as in Charleston, or indirectly from the attendant hate and pain. If that sounds shocking, think about this: how many times have we explicitly asked Black folks to address the ‘problems’ of Black culture, from fatherlessness to violent music to shootings in Chicago? African Americans engage in these conversations regularly. Now it’s time for my White brothers and sisters lead their own conversations as well. We need conversations about why, the moment an African American man was elected to the White house, some people wanted him to “fail” and others desperately sought to “take our country back.” Take our country back from whom? And to where? Where is it, precisely, that some folks would have us go? My brothers and sisters from the majority culture – White Americans – need to have the courage to drive this dialogue, and help us find some answers. In the meantime, Black folks will continue to go to church. We will worship and restore ourselves and mourn. As we have done after Trayvon, Michael, Eric, Medgar, Jordan, Tarika, Martin, Emmett, Eleanor and so many, many more. We will console and pray and hope this sleeping country up wakes up. That others – self-aware, non-black folks – will see the full horror of Charleston and desire to exorcise the demons of our history and present culture. Other than that, I don’t know what to say any more. Nine Black churchgoers were gunned down after their bible study this week, in the year 2015, in my own country. I am exhausted and angry. Like my father, I don’t have the words. I want to know if you can be with joy, mine or your own; if you can dance with wildness and let the ecstasy fill you to the tips of your fingers and toes without cautioning us to be careful, to be realistic, or to remember the limitations of being human. What is Life trying to teach you and are you listening? Although a lesson can be learned from everything that happens in our lives, it’s valuable to pay particular attention to the things that are making some “noise” in our lives.
. . . or many more lessons that will help you become a more empowered person. 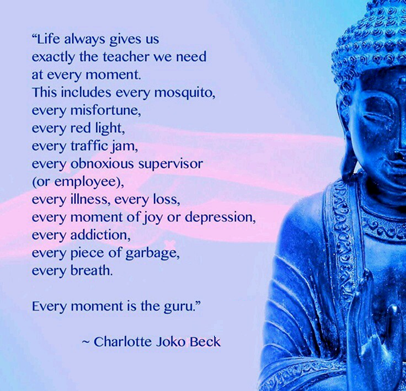 Life is constantly serving us opportunities to evolve spiritually (to become a centered, grounded, loving, joyful, free person) and either we learn how to become that or we don’t. Some of us learn and forget and need to be reminded. Some of us need to be hit over the head several times before we wake up and heed the lesson. Some of us never learn and frequently feel stuck, trapped, anxious, frustrated, stressed, hurt, angry, disappointed, frightened, worries, sad . . .
What I know for sure is that a lesson is taught until it is learned, even if it takes a lifetime . . . and if you don’t learn the lesson, it will be repeated again and again and get louder and louder. The choice is ours. We can exercise some humility and learn what the guru of Life is teaching us, and grow and flourish with vitality and joy. Or we can cover our ears, shut our eyes and refuse to listen or learn and keep doing whatever we’re doing that brings us down. If you keep doing what you’re doing, you will continue to have what you have. If that is good news, then keep doing it. If not, then you have something to learn.